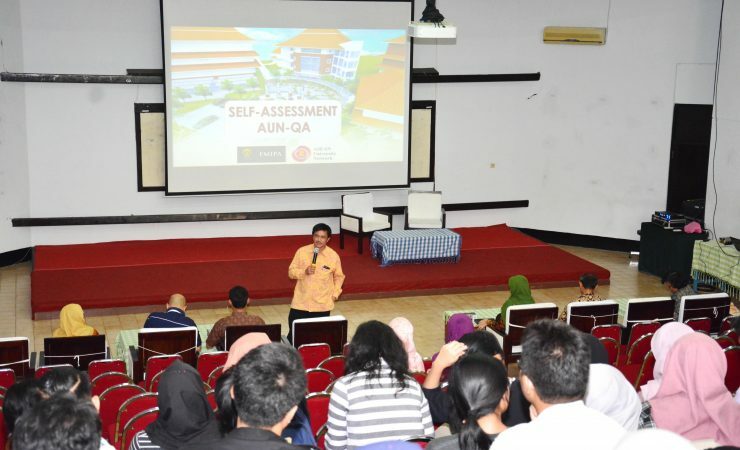 As preparation for the implementation of ASEAN University Network-Quality Assurance (AUN-QA) for Undergraduate Program in Mathematics FMIPA UI, today (14/3) at Building B Room 101, Academic Quality Assurance Unit and leaders of Undergraduate Program in Mathematics held meetings with students, Teaching Staff, Education Staff of Faculty Administration Center (PAF) and Department, to socialize preparation of AUN-QA assessment. This socialization was also attended by the Dean of FMIPA UI and its staffs. In this socialization, Dr.rer.nat. Abdul Haris as Dean of Faculty of Mathematics and Natural Sciences UI explained the importance of FMIPA UI through the AUN-QA assessment because in accordance with the Vision and Mission of FMIPA UI to become a science faculty capable of playing a global role in promoting science and sustainable development, FMIPA UI must obtain regional and international recognition . “If we talk about global competition, we have to do (assess), we have to push on, it means that our FMIPA UI should be recognized both regionally and internationally”. said Abdul Haris. However, continued Haris, the success of this assessment will not be achieved without the cooperation of all related units. Therefore he instructed the related units, especially the Undergraduate Program in Mathematics to condition the teaching staff, educational staff and students to prepare themselves in this assessment. head of the academic quality assurance unit of FMIPA UI, Dr. Ratna Yuniati explained that currently the AUN-QA preparation team has completed approximately 85% assessment preparation phase for Undergraduate Program in Mathematics. The last stage is visitation stage by AUN-QA assessor team which will be conducted on 10-12 April 2018. Visitation This is the most important part of the entire series of AUN-QA preparations. Because, at this part there will be a series of interviews and observations to the study program facilities by the AUN-QA assessor team. The series of interviews will involve the leaders of FMIPA UI (Dean, Vice Dean I and II, managers, and head of the academic quality assurance unit), Head of Department of Mathematics, Head of Undergraduate Program in Mathematics, teaching staff, educational staff, students, alumnies and users. This series of interviews aims to obtain comprehensive data on the practice that has been conducted by the Department of Mathematics and Natural Science UI, both in the stages of plan, do, check and action for all AUN-QA assessment criteria, namely Expected Learning Outcomes, Program Specification, Program Structure and Content, Teaching and Learning Approach, Student Assessment, Academic Quality Staff, Support Quality Staff, Student Quality and Support, Facilities and Infrastructure, Quality Enhancement, Output. Dra. Ariadne Laksmidevi, M.Eng., Ph.D. as the Deputy of Quality Assurance, Human Resources, Sarpras and Financing, who is also a lecturer at the Physics Department of the Faculty of Mathematics and Natural Sciences UI explains that AUN is an independent international body that plays an important role in assessing the quality of higher education. This body is not an accreditation body, but it encourages the process of improving the quality of education in higher education institutions in an effort to improve or equalize the quality standards of universities in ASEAN. While the benefits for universities that already have Certificate of ASEAN Institutional Assessment, Ariadne continued, among others is to photograph objectively the status of academic culture, relevance to the world of work, and facilities owned by the prodi, bridge to the study program to the international level For ease of credit earning process / credit transfer.